Divide your field down the middle as shown and move your goals over. Split your players into two teams and have half of the line up at the centre cone (yellow cone) and the other half line up on the centre of the touchline. 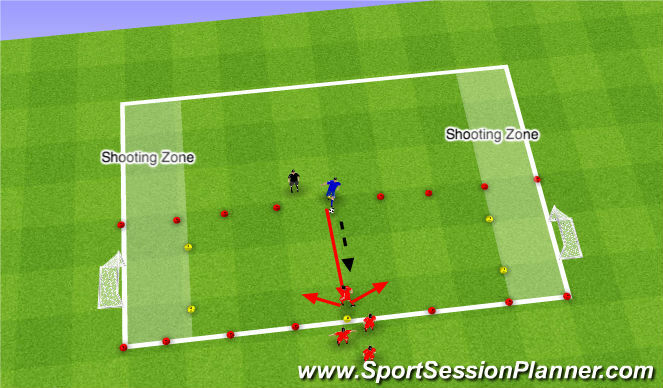 You should also create a shooting zone (about 5 yards) from Each goal. The blue defenders pass the ball across to the red attackers. Players can score in either goal but have to enter the shooting zone before scoring. If the defender wins the ball the defender can score in either goal also. Have the players start as soon as the ball goes out of bounds or is scored. If coaching at the younger age group the coach may want to pass the ball across so ensure accuracy and keep the activity moving along. Can the attackers take a &apos;positive first touch&apos; towards one of the goals? If the defender &apos;seals off a goal&apos; can the attacker change direction and attack the open goal? Can the defender move across to take some of the attackers space qwhile the ball is moving? If you have many players you can play the same game on the other side of the field simultaneously.